Garrapata macho en comparación con una cabeza de fósforo. Garrapata ingurgitada pegada a la parte trasera de la cabeza de un niño. Se muestra el pulgar de un adulto como escala. Las garrapatas pueden encontrarse en la mayoría de las zonas boscosas alrededor del mundo. Son muy comunes en áreas donde habitan cérvidos (ciervos) o en asentamientos humanos. Son especialmente abundantes en zonas aledañas a fuentes de agua, donde animales bajan a beber, y en praderas donde los arbustos proveen protección. El parasitoide Ixodiphagus hookeri, una avispa de la familia Ichneumonidae ha sido ampliamente investigado por su potencial en el control de poblaciones de garrapatas. El modo en el que actúa es común a todas las avispas Ichneumonidas, y consiste en poner los huevos en el interior del huésped, para que, cuando los huevos eclosionen, se alimenten del huésped, matándolo. Otra forma de control biológico es por medio de las aves de la familia Numididae, las cuales consumen cuantiosas cantidades de garrapatas.​ Tan solo dos aves pueden llegar a limpiar 8090 m2 en un año. Argasidae, que son las llamadas garrapatas blandas. ↑ «Q fever». Centers for Disease Control. Consultado el 7 de noviembre de 2010. ↑ Los Angeles County - Department of Health Services Vector Management Program. 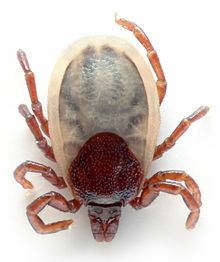 «Managing Common Tick Pests in Los Angeles County» (PDF). Consultado el 20 de mayo de 2009. ↑ Bernard E. Matthews (1998, reprinted 2001). «At home with the host». An introduction to parasitology. Cambridge University Press. pp. 96-120. ISBN 0-521-57691-1. ↑ Samuel, Bill: «White as a ghost: winter ticks and moose audio», artículo en Innovatio Alberta, n.º 145. Faculty of Science, University of Alberta, 23 de noviembre de 2004. ↑ Kirby C. Stafford III. «Tick Management Handbook» (PDF). Centers for Disease Control. Consultado el 7 de noviembre de 2010. ↑ Zahid Iqbal Rajput, Song-hua Hu, Wan-jun Chen,Abdullah G. Arijo & Chen-wen Xiao (2006). 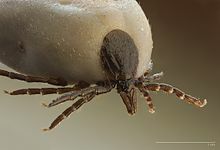 «Importance of ticks and their chemical and immunological control in livestock». Journal of Zhejiang University Science B 7 (11): 912-921. PMC 1635821. PMID 17048307. doi:10.1631/jzus.2006.B0912. ↑ Campbell, John B. (extension entomologist); Thomas, Gustave D. (entomology research leader): «Controllng ticks» (‘el control de las garrapatas’). University of Nebraska Lincoln, Institute of Agriculture and Natural Resources, mayo de 2006. ↑ a b c Stafford K. C.: Tick management handbook: an integrated guide for homeowners, pest control operators, and public health officials for the prevention of tick-associated disease. New Haven (Connecticut): The Connecticut Agricultural Experiment Station, 2004. ↑ [http://www.caes.state.ct.us «Deer reduction», pág. 46. ↑ Rand, Peter W.; Lubelczyk, Charles; Holman, Mary S.; Lacombe, Eleanor H.; y Smith Jr., Robert P. (2004). «Abundance of Ixodes scapularis (Acari: Ixodidae) after complete removal of deer from an isolated offshore island, endemic for Lyme disease». Journal of Medical Entomology 41 (4): 779-784. PMID 15311475. doi:10.1603/0022-2585-41.4.779. ↑ Mark L. Wilson, Anne M. Ducey, Thomas S. Litwin, Thomas A. Gavin & Andrew Spielman (1990). «Microgeographic distribution of immature Ixodes dammini ticks correlated with deer». Medical and Veterinary Entomology 4 (2): 151-159. PMID 2132979. doi:10.1111/j.1365-2915.1990.tb00273.x. ↑ «Deer-free areas may be haven for ticks, disease». Science Daily. 4 de septiembre de 2006. ↑ David Cameron Duffy, Randall Downer & Christie Brinkley (1992). «The effectiveness of Helmeted Guineafowl in the control of the deer tick, the vector of Lyme disease» (PDF). Wilson Bulletin 104 (2): 342-345. Archivado desde el original el 7 de octubre de 2009. ↑ «Hartz flea and tick drops for cats and kittens to be phased out», artículo en inglés en el sitio web de la EPA. ↑ Alberto A. Guglielmone, Richard G. Robbing, Dmitry A. Apanaskevich, Trevor N. Petney, Agustín Estrada-Peña, Ivan G. Horak, Renfu Shao & Stephen C. Barker (2010). «The Argasidae, Ixodidae and Nuttalliellidae (Acari: Ixodida) of the world: a list of valid species names» (PDF). Zootaxa 2528: 1-28. ↑ José de la Fuente (2003). «The fossil record and the origin of ticks (Acari: Parasitiformes: Ixodida)». Experimental and Applied Acarology 29 (3–4): 331-334. PMID 14635818. doi:10.1023/A:1025824702816. Wikimedia Commons alberga una galería multimedia sobre Ixodida.